Home / Blog / Sprained your ankle? What causes a sprained ankle? Ankle sprains are very common. They are the number one injury presenting to most emergency departments. Most of us will have experienced an ankle sprain at some point in our lives. This acute injury commonly affects the ligaments on the outside of the ankle as they get over stretched when our ankle rolls. sometimes other tissues around the ankle can be injured too. If you are fit and healthy then the tissues will heal within 6-8 weeks. New tissue is built and deposited at the site on injury and forms a scar. 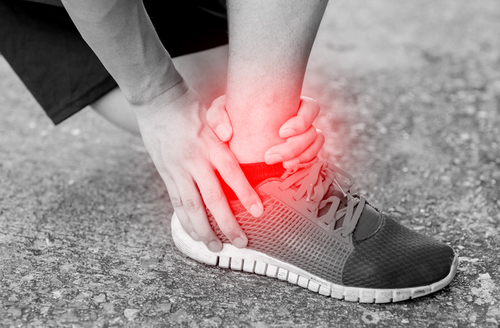 pain is a common symptom of ankle sprain as this injured soft tissue and the healing chemicals that need to be there during the repair process are painful. This is a useful pain as it reminds us to listen to the body as it is repairing and not to overdo it. As you heal this pain will usually reduce at the same time. What factors can influence symptoms and how they can be addressed ? 1. Multiple Ligaments – Have a clear idea of the amount and number of ligaments damaged: it is not as simple as ‘one size fits all’ with ankle sprains. There are multiple ligaments around the ankle but also these ligaments can be sprained to differing degrees. There are many tests available to help medical professionals test the amount of ligament injury that has occurred. These tests have variable reliability (sometimes we cant fully trust the answer the test gives us). Testing the ligaments fully and individually will allow a clear idea of how much physical injury has occurred and therefore a realistic idea of how quickly you should expect to recover. It is then vital that you follow that advice and try not to push too early as the risk of re-injuring is high after the first sprain to an ankle ligament so limiting the risk of going over on your ankle again in the early days of recovery is vital. 2. Positioning – The position your foot adopts both before you even injure your ankle, the natural anatomy of your foot but also the position is chooses to adopt after the injury is important to how you may recover. Research has shown us that people who weightbear more on the outside edge of their foot are more at risk of injuring their ankle ligaments by rolling their ankle. This is because you are already closer to the limit of where the ligament gets stretched and so rolling outwards on the ankle can occur easier. It also seems that once a ligament is stretched that the inbuilt warning system of messages that pass from the ligament up to the brain telling the body where the foot is and how it is positioned is altered. This might be because the ligament has been stretched and is now longer than it previously was. This means that when we move and test the ligament in these normal movements it is harder for the signals to be stimulated and so we get less signals or less accurate signals telling us where the ankle and foot are on the floor. This means we are more vulnerable to re-injury. Learning how to position your foot accurately and practicing these movements is vital for full recovery. 3. Strengthening – Commonly after injury patients are given a set of exercises to do that might include strengthening the ankle muscles to support around the ankle ligaments like a corset or brace that we might wear. This is good news. However, often either patients start to improve and then forget the exercises, or they are worried about how much to do or their therapist looking after then simply doesn’t progress enough and re-injury can occur. it is important that strengthening happen right into the movements that the ankle is most vulnerable in. this normally means into that turned in position of the foot where the injury likely occurred. This is important to ensure that if the ankle goes near this movement again that it can bring itself back ‘from the edge’ so to speak. This is particularly important if, as we mentioned in point two, the ankle ligaments are a little floppier and cannot give the warning that too much of this movement has occurred. making sure you get higher level progression of your exercises will work on this factor. 4. Stiffening – Often after this type of injury the ankle will actually stiffen up as a protective response to the injury and to try to prevent further problems. this is also often due to the pain and swelling involved with the healing process. this is normal in the short term but must be addressed as you heal in order to allow you full use of the ankle and full recovery. getting someone to mobilise the ankle or teach you how to mobilise it yourself if it is stuff is helpful. it might seem that stiffening up sounds like a good idea to prevent future sprains but this is a false economy as we need this normal movement to do the things we do like walk up and down stairs and run or squat. 5. Non-Compliance – Research has looked at why some ankle complaints don’t get better as they should. one big risk factor that has been identified is non-compliance with the rehabilitation advised. it might seem obvious but if you avoid normal movement, don’t get rid of stiffness, fail to return your strength to normal and stop exercises early then you do risk the condition taking longer to recover. So get in their early and work hard to recover your ankle as it should, its worth it to prevent future problems and to get back to your activity.